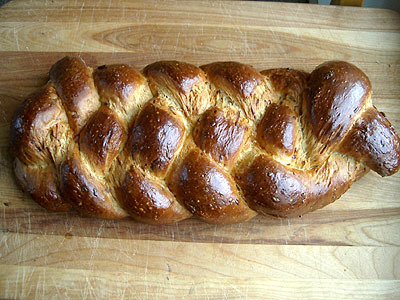 I based this on the Onion Twist Bread in Bernard Clayton's New Complete Book of Breads. I reduced the amount of yeast and used a poolish, and went for a braid instead of a twisted and panned loaf, but otherwise it is basically the same. 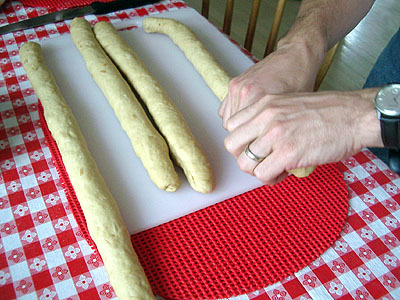 Cover the loaf with a damp towel or greased plastic wrap and allow it to double in size again, approximately 45 minutes. While you are waiting, preheat the oven (and baking stone, if you have one) to 450. Just before baking, glaze the loaf with the egg wash. Put it into the hot oven. After 5 minutes, reduce the temperature to 375 and bake for another 15 minutes. Rotate the loaf and bake until the loaf is done. Total baking time may vary based on shape. My loaf took about 45 minutes. Yum! That looks really good. How did it taste? It almost looks as if you used whole wheat flour. Did the golden color come from the soup mix? It wasn't bad. Not as oniony than I had hoped, but less oniony than my wife feared. It smelled *wonderful*. It almost looks as if you used whole wheat flour. Did the golden color come from the soup mix? Yes, the color was from the soup. did it taste salty ? I don't recall it tasting too salty. Is the one egg listed for the egg wash, or does a egg also go into the dough? One egg in dough, one egg for wash. It looks to die for! I am also new here, and this looks fantastic! 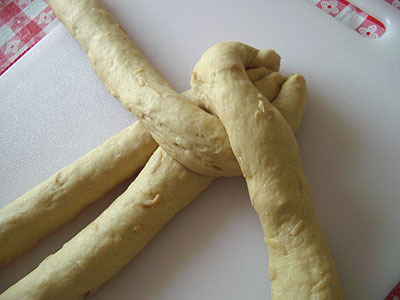 I found this site scouring the web for a braid recipe to do for Easter next weekend. I found this and I can't wait till then! Maybe a few "practice loaves" would be in order! I finally got some plastic bakery style bags so that my friends I keep covering up with my bread baking obsession don't have to bring their own towel or whatever to cart all this home with them! My family loves home made bread, and it's a good thing. The bug hit me hard! I have joined and this site is in my favorites. Thanks for the new inspiration! 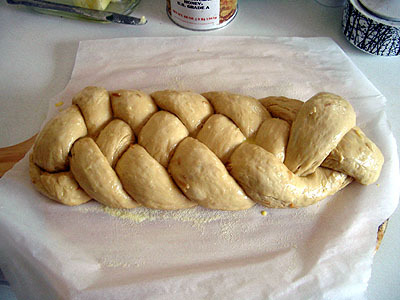 I couldn't wait and started this onion braid this morning. It looks so inspiring in your photo. I found out one thing about my self today....for a woman, I cannot braid worth a flip! I had to undo this loaf 3 times to get it right. The instructions are fine, I think I'm just a SPAZ! ANY WAY! It is in the oven and smelling TOO FINE! Also my little girl is happily playing with a small piece of the dough I saved out for her. The loaf will be fine with 17 inch ropes instead of 18's. I wish my mom had let me play in dough, so I let her. I hope the home made bread bug is contagious and my daughter and I can make bread together for years to come. Thanks for the inspiration, and the recipe for the tasty loaf! Happy Baking!! 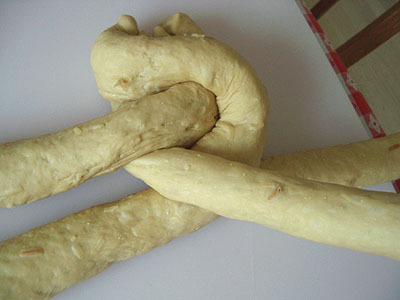 I'm going to make this bread next week I think. 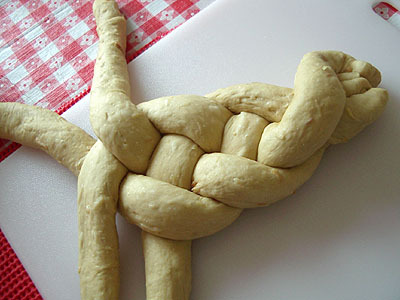 I've always wanted to make a braided bread. This is too pretty to pass up and I love onion bread. This look like it turned out well. Do you know what the internal temp was when it came out? I have a similar recipe I have been wanting to try for onion rolls that doesn't have the egg wash. 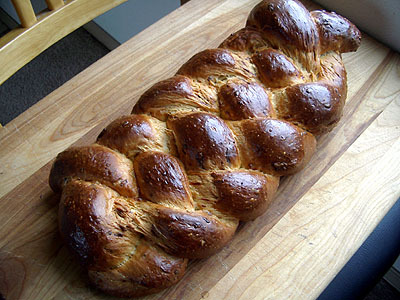 I think I'll try to do some fancy breads for next week also. Thanks for the nudge. I am frustrated with this site, love the bread and the blogs, but the pictures are hell, only half of them load, and then that half only half loads, no matter what I do. Not that I need the pictures to braid, but I would have loved to see the finished product, not the top 1/4 or so of the picture. 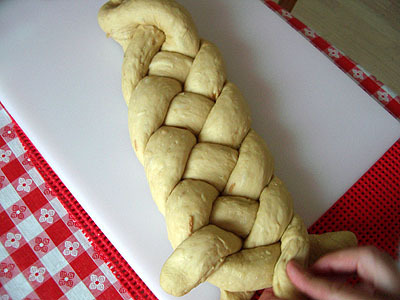 However that said, I will try the bread out, and it sounds wonderful, will also try the variation of filled braids that someone told about. That is for more time though, the onion soup would be quicker if you were working against time. The images in this thread, as well as the others on this site, load within seconds for me. All of them, even when using two separate browsers opened to TFL at the same time. Am guessing the two folks claiming the photos don't load may be having issues with their own hardware/ISPs/security software, or maybe even the browsers they are using. For what it's worth, I'm running a five-year old desktop and alternate between Chrome and Firefox on my home DSL connection. Heck, the photos even load quickly on my work computer, which is an ancient box using Windows 98 and an old version of Firefox. The problem isn't here, that's for certain. DITTO for me, old computer, somewhat fast hookup, no problems with the pics. for those that had problems, they were pretty spectacular! 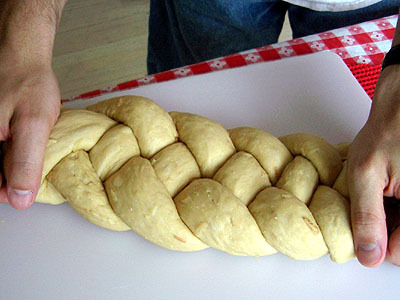 First, Floyd, the onion braid looks scrumptious and can't wait to try it. Thanks for the detail on the braiding technique. Should be a snap to replicate. As to the computers, I'm fast closing in on almost 3/4 of a year of daily viewing of TFL and I've never had an issue with loading photos, text, slow links or anythiing. This has to be one of the best websites I've visited if not THE best since I've been using personal computers to surf the old "Well" back in the 80's or 90's. Currently I use a MacBookPro or an I-Mac, but I've had plenty of time staring at HP's, Vaio's, and so many others I can't remember the names---but TFL.com has been one of the most reliable things ever in my computing involvement. Whatever you do, Floyd, keep on doing. I've been wondering if you had a Cray sitting up on a hilltop in Santa Rosa witht the quality of what I've seen here. Thanks, Bernie. I do what I can to keep the site running smoothly. And, yes, I agree, it'd be great to catch up with their baking. I know I know I know , you do not have time, use dried onion flakes reconstituted with water, or onion powder in the flour (or both) of mince fresh and nukem (user the water they give off), or brown the mince in a little butter til they carmelize. Onion soup mix can taste just like a rubber hose sometimes, even national brands can.